You know how sometimes everything seems to go wrong in the kitchen? Well I had one of those experiences last night. We were going to bbq some chicken and I had a coleslaw in mind as side-dish. But when I peeked into the fridge Mr Limp & Listless was peeking out from the vegetable crisper (now there's a misnomer if I've ever heard one! ), and so the coleslaw idea was tossed out. Then I started eyeing up the flour innocently fluttering her eyelashes at me from her fridge prison and an idea started brewing - I could make a foccacia, grill it on the bbq and top it with roasted aubergines. Yes! Um, no. I don't know what happened, but that flour stubbornly refused to come together properly. At this point I was pretty fed up. And irritated. And super-emotional snotty-nosed slightly teary-eyed.And of course once I started getting teary-eyed, everything just seemed Undoable and I seemed Unable to Cook and all I wanted was chocolate! Okay so you're probably wondering what this has to do with Bibimbap? Seriously, longest roundabout in history, right? The point is - sometimes things don't work out as planned. 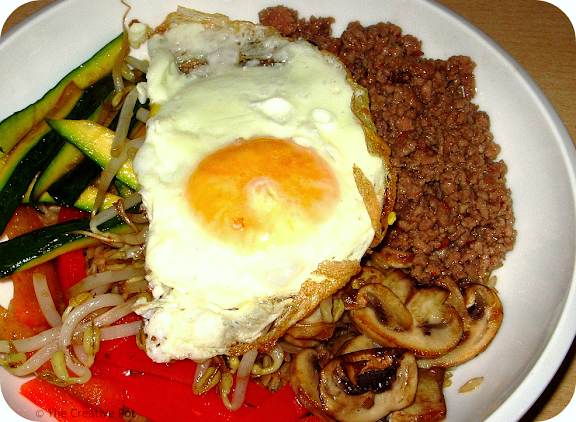 Bibimbap is great for those times, since you can use pretty much any vegetables you have lying around (hell you can even substitute another protein for the mince) and it'll somehow work out. And taste uh-maaaaaaaazing. With absolutely no need to get all teary-eyed. Unless it will get you more chocolate. 1. Heat 1 tsp vegetable oil in a wok, fry beef over high heat until browned. Add soy sauce and sriracha, fry another 1 minute, then remove from wok and set aside. 2. Heat another 1 tsp vegetable oil in the wok, add babymarrows, fry until cooked (but still crunchy), set aside. Repeat with bellpepper, mushrooms and beansprouts. 3. Lastly, break eggs into a medium sized frying pan, fry over medium heat for a few minutes until cooked to your liking. 4. To serve - spoon rice into serving bowls and allow everyone to add beef and veggies as desired to their bowls. Top with a fried egg and add some sriracha and soy sauce to taste. Mix it all up and enjoy! Thanks for dropping by my blog... it made me find yours! that looks like a like an amazinglydelicious meal. I read the ingredients...what is a sriracha? Ive never heard of it. I love it when I learn of new ingredients. Sriracha is a garlic chilli sauce - you should be able to find it in the asian section of most big supermarkets. One of my all-time favorite Korean dishes. I always order it. I, too, love the unplanned nature of the dish. You mix it up and everything that once seemed disparate now all comes together so cohesively. It's a magical dish in its simplicity.